Praying for you and your family as you go through this!! Love ya! Narcie! We lift you up in our prayers! Narcie, praying for you as you go through the surgery. It is hard to believe it has been three years since your last surgery. Give you mom and dad my love. The neat thing about the motor cortex (ok, the brain in general) is that, if there is weakness, the brain is awesome at adapting for that stuff. 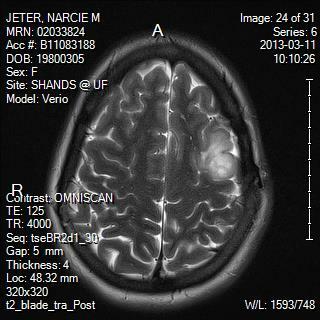 And, I’m a total brain geek, so I really wish I could do your PT 🙂 I do know a PT at Shands Gainesville, so let me know if you want her name 🙂 Will be praying for you, love!! Wow – so sorry to hear that the time has come around so quickly for more surgery, Narcie. I know that the timing isn’t the best with your new position there in Gainesville, but rest assured that all who prayed you through the last time will do the same this time – and you have the Gators joining in, too. Prayers for strength and peace of mind, heart and spirit as you prepare for this surgery. Please know Joseph and I have you and your family in our prayers Narcie. We also will ask for prayer in our congregations and put the Connection to work! Have a blessed Easter! Mary and I are praying hard for you and your family! Praying for you Narcie! Love and miss you! Narcie, prayers going up daily! God has made you such a strong woman and will see you through this once again! We miss you at St. John’s. You are in our prayers, Narcie. Praying for you and your family Narcie. God will see you thru this and all of us in the Lydia community will keep you in our thoughts and prayers. Sending hugs your way…. Everyone in your St. John’s UMC family is praying for you and your family, Narcie! I will keep you and your family in my prayers! You are loved and have a lot of prayer warriors in South Carolina. Love you! Along with all your ‘family’ at St. John’s, your family and friends everywhere, we will again pray you through this surgery. We love you and miss you. Praying for you, your family, and your medical staff!!!! Narcie, I hate to hear this news. Cyndi, Kirby and I will be praying for you. I will lift you up on our community prayers this Sunday. Praying for you, for your surgeon and staff, and your family and support team. Love and prayers to you and your family. You, Mike, the children, and your parents along with the nurses and doctors will be in our thoughts and prayers. Love and Hugs from the Rock Hill Zeiglers. Dear Narcie and Mike, You and yours are in my thoughts and prayers. Lifted you in prayer already twice today. I even laid hands on the computer screen for you. Hugs and squishes!!! I am so very sorry to hear this news. Please know that I am praying for both of you as you face this disease. Remember the words from Revelation…”there is a place of no more tears, no more death, no more sickness.” Jesus has won the victory over all things, and we pray he will have victory in this situation as well. Narcie, sorry to hear this news, we know a living God, he is good and merciful,as we enter Holy week new beginnings comes to mind, I know it will be a positive new beginning for you and you wonderful family, Prayers will go up for you and you family, Happy Easter.